New Relic APM + Lucent Sky AVM = Awesome! Constantly monitoring your applications so you don't have to. 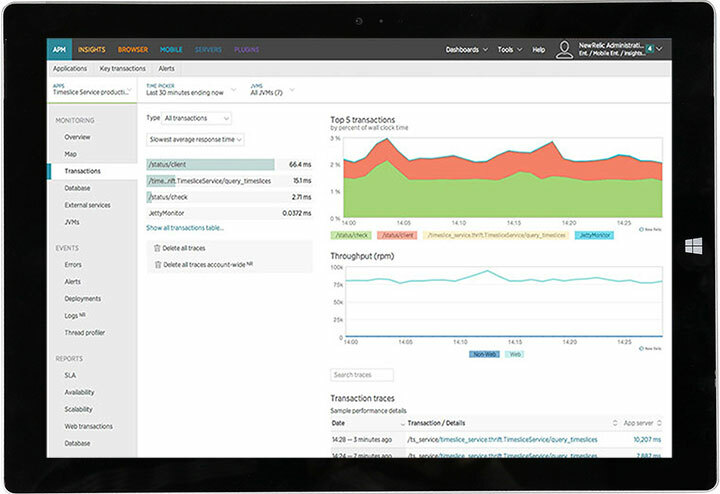 New Relic's SaaS-based Application Performance Monitoring helps you build, deploy, and maintain great web software. It also integrates seamlessly with Lucent Sky AVM, enabling you to have your high-performance code and secure it too. Spend more time building great software and less time fighting it. 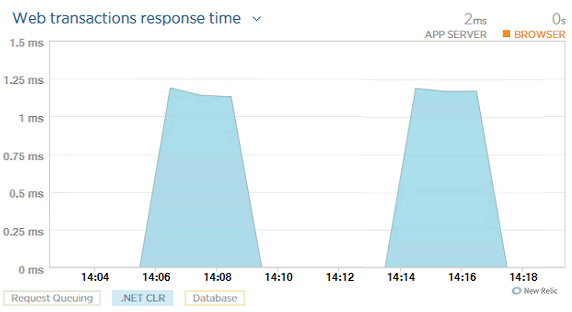 New Relic APM surfaces issues you cannot see coming, helping your team reduce resolution times so they can focus on writing new code, not troubleshooting it. Follow the performance of a critical transaction across your entire service-oriented application environment. Drill down to see the performance impact of specific code segments and SQL statements. Flag your most critical transactions to quickly spot when things like response times, call counts, or error rates perform poorly. Gain deeper insight into a key transaction's performance by showing transaction traces alongside long-running profiler results. Feature rollouts, traffic spikes, whatever they throw at you - take it all in stride. What’s bottlenecking performance? The app? The CPU? The database? New Relic APM allows Development and Ops teams see every aspect of an application’s environment in real-time. Let the right people know when critical issues arise using alert policies to send email or push notifications. 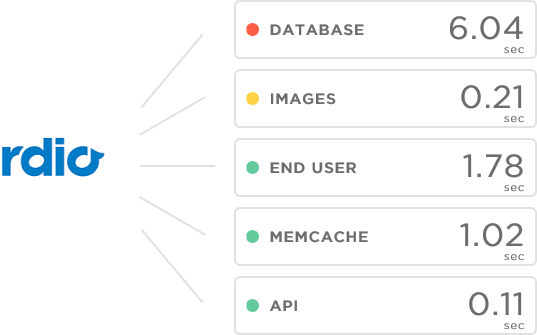 Integrate with PagerDuty, Campfire, HipChat, or use webhooks. A clear picture of your application's relationships to other services and the influence of each service on the others. If one service fails, you can see at a glance which other services are affected. Better understand where application performance is heading using the following operational reports: SLA, Availability, Scalability, Capacity, and Deployments Dashboard. New Relic is committed to helping customers make their applications fast and secure. Understand your customer's experience as it happens. How is the performance of your application's critical features affecting the experience of your customers? New Relic APM delivers easy-to-understand, intuitive, and actionable data. You get deep visibility into server side code, database calls, and third party APIs - then tie in New Relic Browser to see client side performance. 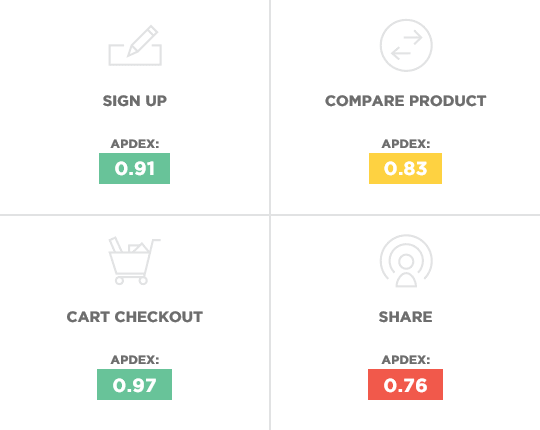 A simplified SLA solution, Apdex measures the ratio of satisfactory response times to unsatisfactory response times and provides a score that gives you better insight into how satisfied users are. Integrates seamlessly with Lucent Sky AVM. Secure your applications and monitor their performance - without writing a single line of code. Once linked, applications in Lucent Sky AVM are automatically mapped to their counterparts in New Relic APM. Applications created in the future will also be mapped. Switch from the security view in Lucent Sky AVM to the performance view in New Relic APM with just one click. Performance and security are no longer trade-offs. See the little (if any) performance impact in realtime. Your free New Relic Standard account is waiting.